Spring means sunny skies, warmer temperatures, and a whole new makeup palette. A new season makes for the perfect opportunity to try out new beauty routines and trends, so what are you waiting for? Below, some of this spring’s most popular new beauty trends to add to your routine. This spring is all about changes to eye makeup. Dramatic eyes are making a scene, but so are nearly bare eyes. A minimal eye makeup look, with no mascara and well-tamed brows, makes a major statement. This is especially popular when paired with bright red lips. On the other side of the coin, the cat eye look is making a major comeback, but with its own 2018 twist. Cat eye never really goes out of style completely, but it’s been about ten years since it took over the “trend-verse”. This time around, that thick, precise, liquid liner look on the upper eyelids is marked by a more bubble-like appearance. Instead of a sharp, pointed wing, runway models have been sporting a bubbled wing. 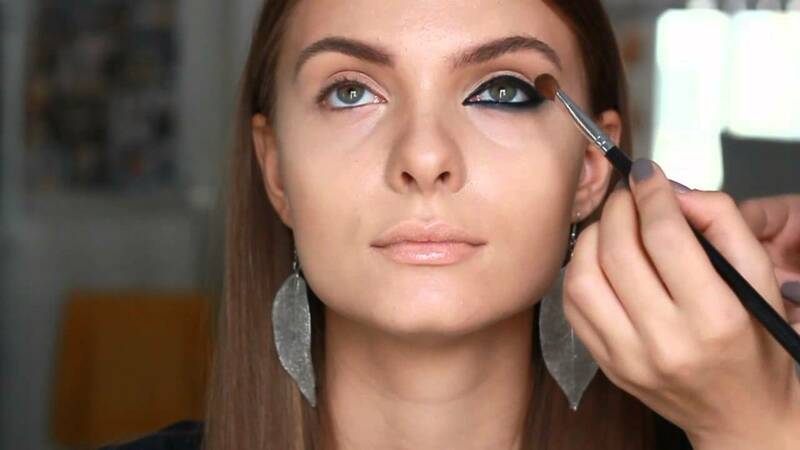 It’s a fun, easy way to add some major drama to your daily look. One thing’s for sure: no matter how much this spring’s eye trends differ, they’re all about making a statement. Another trending eye look is bright, vibrant pencil liner swiped across the lower lash line. Bright blue, turquoise, and violet seem to be the most popular colors, and they’ve been showing up everywhere on the red carpet this year. It’s like a modern twist on the colorful ‘80s eyeshadow look. If the past few years in the beauty world have taught us anything, it’s that highlighters and illuminators are here to stay. The coveted dewy aesthetic aided by a great illuminator almost serves as a slightly more minimalist foil to the heavily made-up contouring look. What makes the highlighter trend so unique this time around is the shade: pure gold. Singer and artist Rihanna recently released a gold highlighter as part of her Fenty Beauty cosmetics line, and it’s created shockwaves throughout the beauty world. The gold shade makes a major statement, and other brands released similar shades soon afterward. It’s a bold, beautiful look that adds a whole new level to your glow. This spring, violet is having a major moment—especially the bright, psychedelic variation of the color. Ultra Violet was deemed Pantone’s 2018 color of the year, and this makeup trend certainly reflects that. If there were ever such a thing as a violet smoky eye, it’s revealing itself this spring. Celebrities have hit the red carpet with violet eyeliner, artfully smudged violet eye makeup and even multi-tone violet eyeshadow. Whether it’s shimmery or matte, violet eyeshadow, liner, and powder will be flying off the shelves this season. You can even create a hombre look on your eye with several shades of purple on your eyelids or even your inner eye. In addition to the vibrant, neon colors appearing on everyone’s eyes this spring, peach is growing in popularity. With the rise of rose gold, millennial pink, and blush shades in everything from clothing to home décor to cell phone cases, it’s no surprise that more and more of us are looking to flaunt some peach on our faces. What’s great about this shade is that it can look great nearly anywhere on the face. Peach makes for an excellent shade of blush or tinted highlighter. It’s also a beautiful soft lip color for pastel spring days. Of course, peach also looks excellent as an eyeshadow, eye shimmer, liner, or a tiny pop of color on the inner eyes. The ‘90s are back—sort of. We might look back fondly on the heyday of body glitter, but 2018s glitter trend is more versatile. You can go for a subtle, shimmer look, or a dramatic and heavily pigmented swipe of glittery eyeshadow. No matter which one you prefer, you’ll see the glitter look lighting up ladies’ eyes all spring long.